Whipped Ricotta Prosciutto Cracker Bites are the perfect Christmas appetizer recipe or New Year’s Eve appetizer that comes together in no time at all and is so easy to make! I have the cutest little appetizer to share with you today. I think this Whipped Ricotta Prosciutto Cracker Bites recipe would be perfect for Christmas Eve, to serve before Christmas dinner, or a New Year’s Eve appetizer/snack. I couldn’t believe how something so easy could look so fancy and be packed with so much flavor. 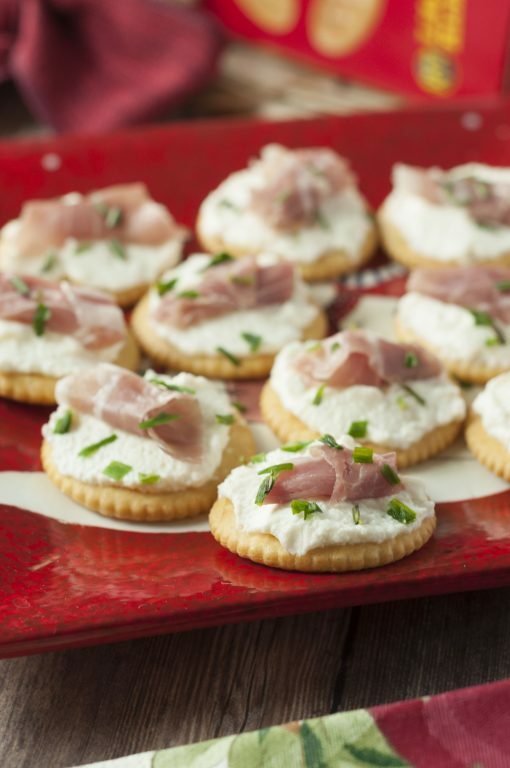 I worked with Ritz crackers last year on a social media campaign where I was in charge of coming up with an easy appetizer and these Ricotta Prosciutto Cracker Bites are what I came up with (I just never shared it on the blog before, only on Instagram). 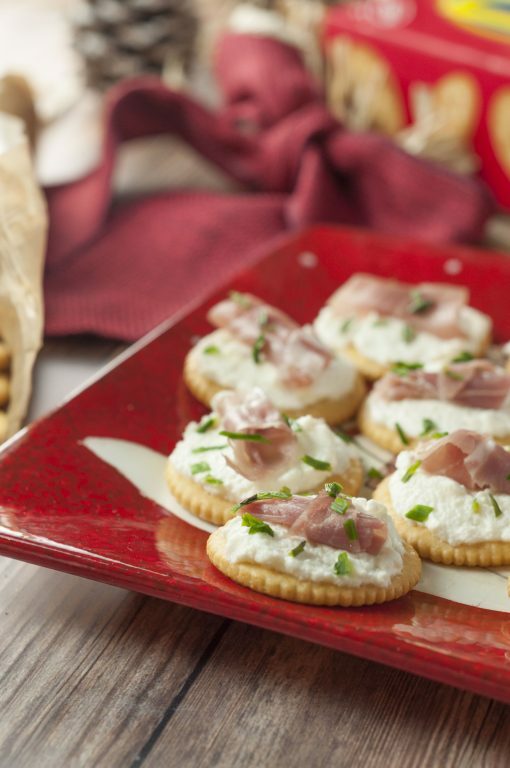 Ritz crackers or any type of crackers are a great base for building an easy, bite-size snack or appetizer to serve. I love how versatile they are! You can feel free to use ANY crackers with this recipe – whatever your favorite type is! I did find that the longer these sat out, the crackers became a bit soggy. I would assemble these right before serving (or as close as you can get) for the best results. The flavors will be awesome either way, but you’re really going for that whole crunchy cracker thing here. Crock Pot Italian Meatballs – these are so easy and you can use frozen meatballs! Just add the sauce! Ham and Cheese Stromboli – everyone loves this on the holidays, but it also makes a great dinner! It’s similar to a calzone! Crock Pot Grape Jelly BBQ Cocktail Sausage – these are always quick to get gobbled up and only take a few minutes of work to put together! Whipped Ricotta Prosciutto Cracker Bites are the perfect Christmas appetizer recipe or New Year's Eve appetizer that comes together in no time at all and is so easy to make! 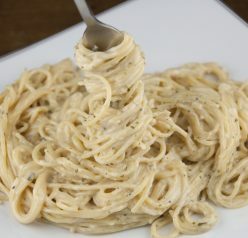 In a small mixing bowl, mix ricotta cheese, garlic, olive oil, and salt and pepper together until combined. Cut prosciutto into triangles. The triangles should be small enough to top your crackers. Using an off-set spatula or knife, spread just enough of the ricotta mixture onto each cracker, until each cracker is covered. You don't want the layer to be too thick. Roll each prosciutto triangle into a small cone-like shape and place each on a ricotta-coated cracker. 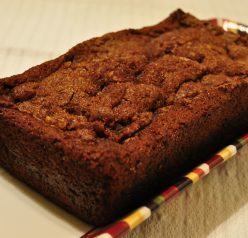 Drizzle a small amount of honey over each. Sprinkle with chopped chives for color and a little extra flavor. Serve immediately or crackers will tend to get soft/soggy if they sit out too long. Enjoy! These are so cute! Thanks for letting us know to assemble right before serving. I think this would make a perfect lunch for me! I could eat a million of these because they look so darn good. Prosciutto is my weakness. 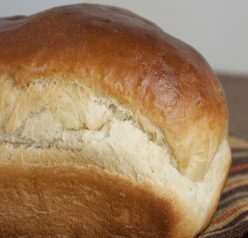 So easy and delicious!!! I’m saving this recipe for our next party! I love how easy these are and they’re so perfect for entertaining! There’s nothing on that bite that I don’t like : ) Yum.